Many brides are choosing to let go of some of the traditional aspects of a wedding and make it more suited to their personality and lifestyle. One of the traditions many brides are giving the boot is the bridal party. Simplicity seems to be the guiding force in this new trend, however there are plenty of reasons why brides are choosing to nix the bridal party, and there is no right or wrong answer when it comes to deciding what’s best for your wedding. For the brides who have multiple sisters, a large group of close friends, and plenty of female cousins, it can be hard deciding who makes the cut. If the bride is concerned over hurt feelings, the bridal party can suddenly become a source of stress, rather than a fun part of the planning. No bride should have to deal with moms not talking to aunts, cousins not talking to other cousins, and friends creating drama. Many brides in this particularly sticky situation are choosing to avoid the stress completely and not have anyone be a bridesmaid. The lack of a bridal party creates a level playing field, and everyone can enjoy the wedding as a guest. Brides and grooms-to-be who are choosing to have a casual wedding ceremony and reception may feel that the traditional bridal party is a step in the wrong direction. A bridal party can often feel formal, even if the attire isn’t, and many brides and grooms feel that it doesn’t mesh with the informal feel and look they are going for. For a backyard, BBQ buffet-style wedding, it is perfectly okay to skip the line up of bridesmaids and make it more of a relaxed party than a wedding. But couples who wish to keep the church ceremony can also partake in this new trend, especially if you have your heart set on an adorable, small church that doesn’t offer a whole lot of space at the alter. 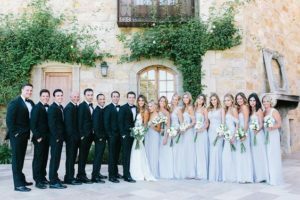 The laid back trend can be seen everywhere, including less traditional wedding gowns, so to skip the seemingly fussy and formal tradition of a bridal party makes sense for a lot of couples. For some soon-to-be brides, the idea of asking your dearest friends and family to wear matching dresses they may not like and to perform various tasks on your wedding (and weeks and months leading up to the big day) doesn’t sit well. Many brides feel that this beck-and-call power traditionally bestowed to the bride is not the best way to show your friends and family you care and appreciate their support. Rather, many brides would like their close friends and family just to have fun at their wedding instead of feeling like they need to tend to the bride’s every command. They can wear what they feel comfortable in and can celebrate the special day as a friend, sister, cousin or whomever rather than as a dutiful bridesmaid. Choosing to have bridesmaids definitely adds to the overall wedding budget couples have. And even though it may not cost a lot to the bride, many don’t feel comfortable asking their friends and family to shell out the costs that will be required of them. Many brides cannot afford to purchase all of the dresses, hair and makeup, jewelry, etc. for the bridesmaids, and they feel that these purchases shouldn’t be a requirement of their friends and family either. If some of your friends or family live out of town, these extra costs can really add up if they have to pay for a plane ticket just to be present at your wedding, and not to mention, make it to all of the “bridesmaids requested” events like engagement parties, showers, and bachelorette parties. Many brides feel that a no-obligation policy is the best way to relieve the pressure from their loved ones. When your friends and/or family members are your bridesmaids, they will have most likely been through the process with you from the beginning. Chances are, they have visited a venue, tasted the cake, seen your dress, and been involved in making DIY crafts and décor. Once the big day arrives, they aren’t surprised like all the other guests to see everything put together. Just as everyone loves watching the groom’s face as the bride walks down the aisle, friends and family can also share in the awe as they see you for the first time, along with the venue and décor. The day will truly be a treat for everyone. Having a bridal party is a lovely wedding tradition, but it’s not for everyone, and that’s okay. If you absolutely want to have bridesmaids, go for it! But if you agree with your partner that having a bridal party isn’t something you feel is necessary, don’t feel guilty not asking your friends and family to be bridesmaids (and groomsmen). Everyone will be happy just to be a part of your special day. Are you going to have a bridal party? Choosing to opt out for your wedding? Either way, you need an amazing venue to house all of your family and friends. Be sure to check out the Hollywood Banquet Hall in Los Angeles for your lovely mid-sized wedding.